FRII is a non-profit association for fundraising organisations, and we have a board that consists of eight board members representing FRII’s member organisations. The board is elected by the general assembly, it is on a voluntary basis, and the term is two years. You can find their contact details below. FRII’s board 2018-2019. 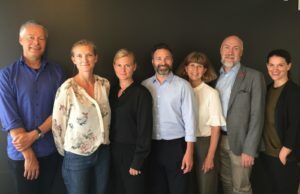 From left: Jesper Nilsson, Lovisa Fhager Havdelin, Cajsa Wiking, Johan Pettersson, Eva Rundgren Forsberg, Per Leander, Cecilia Chatterjee Martinsen. (Marika Hjelm Siegwald is not in the photo.) Photo: Charlotte Rydh.